I’ve already reviewed the Lego Dimensions Starter Pack and everything it offers, but for those with a little more disposable income and an unending hankering for those little plastic sods there’s more content to be bought should you so desire. To date, Lego Dimensions has five extra Level Packs, each of which can be bought separately. Each contains a new level, as well as a character from that franchise and two vehicles or gadgets. I’ve bought and played all five, so every day this week I’ll be publishing reviews of each of them, explaining exactly what you get and whether they’re worth buying. 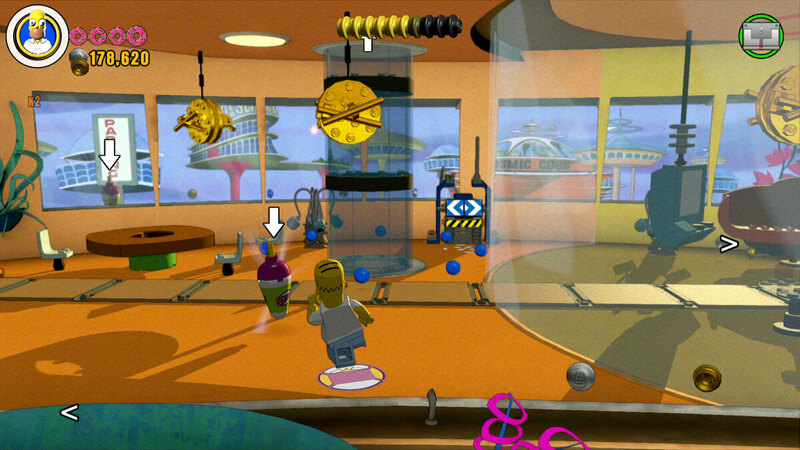 Given that the Simpsons’ house has been one of the most popular real-world Lego kits in the past couple of years, it’s fitting that the greatest cartoon of all time should get special treatment in Lego Dimensions with its own stage. 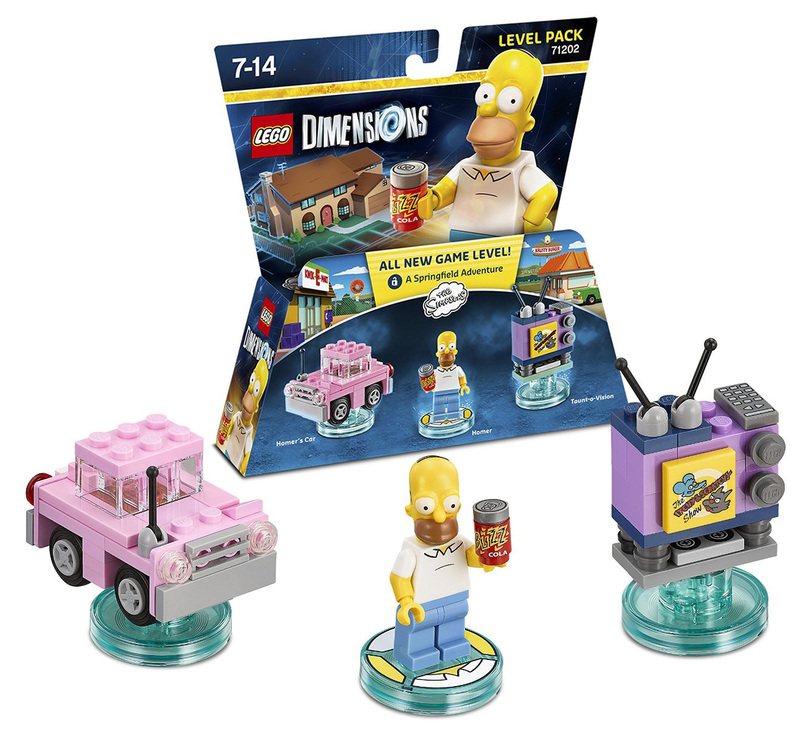 The Simpsons Level Pack comes with a Homer Simpson minifig, Homer’s car and the Taunt-O-Vision, a special version of the Simpsons’ television that I don’t remember them ever having in the TV series. The new level, entitled The Mysterious Voyage Of Homer, is based on the Season 8 Simpsons episode of the same name, in which Homer eats some insanity peppers and has a hallucination. It’s split into four different sub-stages, each based on different parts of the episode. Following an entertaining cutscene in which Marge tries her best to stop Homer discovering the nearby Springfield chili cook-off, the first section dumps you outside the Simpsons’ home and tasks you with building Homer’s car before you can drive to the cook-off. Once you get to the cook-off the second section begins. Here you have to solve puzzles to gain access to each chili stall and try each of the chilis on offer. Eventually you get to the end, eat Chief Wiggum’s Guatemalan insanity peppers, and start to hallucinate. The third section takes place inside this hallucination, as you wander through a constantly shifting desert landscape. Eventually you encounter the Space Coyote (voiced by Johnny Cash using archive recordings) who tells you to find your soulmate. Finally, the fourth section has you making your way to a lighthouse, where Homer expects to find his soulmate. No spoilers as to whether he does (though anyone who’s seen the episode will already know how it ends). This is an entertaining level, and one with a refreshing amount of variety compared to some of the other level packs available. By dividing into Springfield and desert areas it feels almost like two separate levels, and it should take you a little under an hour to beat on your first playthrough (as long as you don’t rush through it). Naturally, as with any Lego game stage there are some hidden minikit pieces to find and, this being Lego Dimensions, you aren’t going to get them all until you have a bunch of other figures. For the most part this isn’t really a big deal – they’re only extra collectibles and you’ll still be able to solve all the main puzzles and complete the stage only using Homer and the two gadgets he comes with. 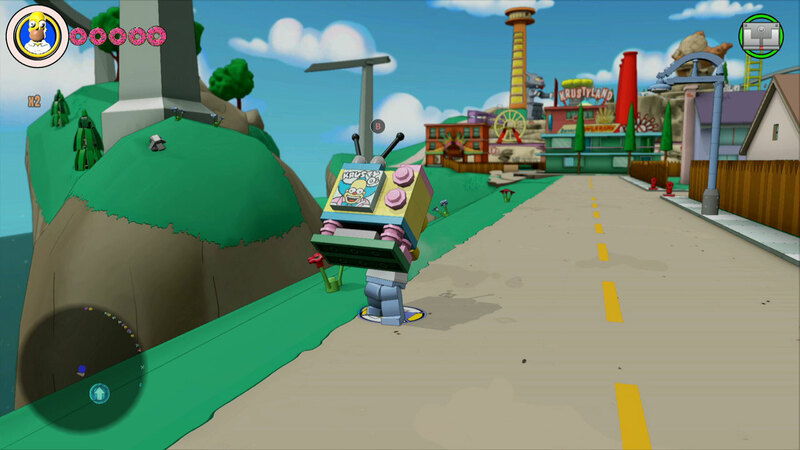 That said, fans of Hanna Barbera cartoons might want to consider also getting the Doctor Who level pack because there’s a bus in this Simpsons level pack that, once broken, reveals a dock for the TARDIS that leads you to a secret Jetsons area. Of the five level packs released to date The Simpsons is one of the better ones. Its Springfield section has some funny moments (not to mention some great Simpsons-style comedy signs to read) and its desert section plays some clever tricks with the shifting environment. 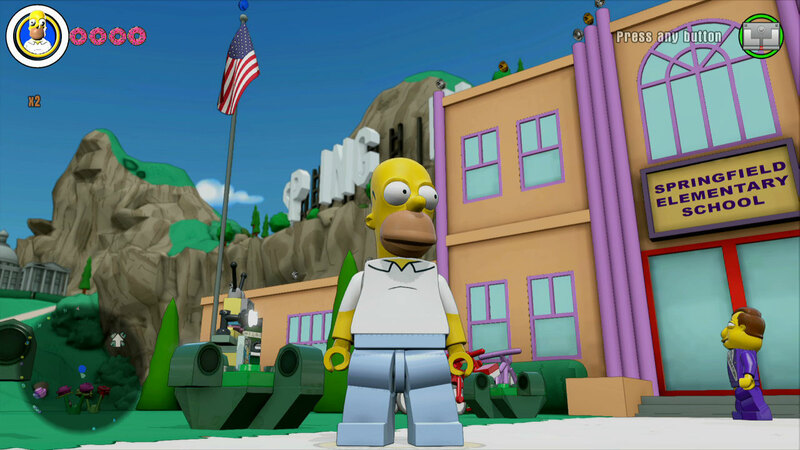 As well as the level itself the Level Pack comes with a Homer Simpson minifig. The figure is well built and is accompanied with a can of Buzz Cola (not Duff Beer, because kids). 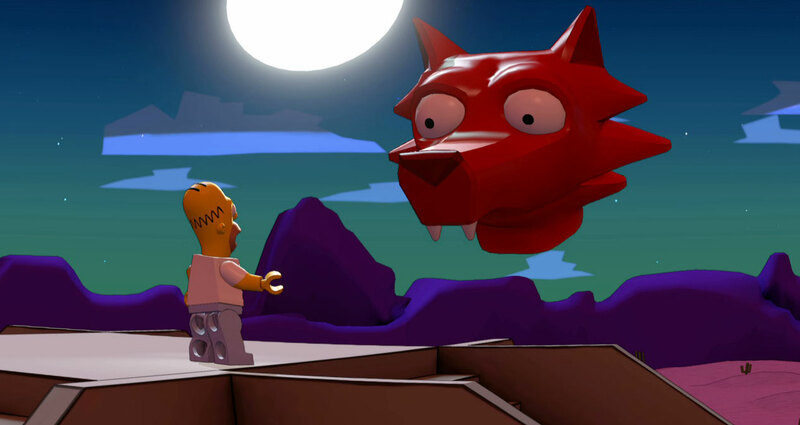 In-game he’s obviously voiced by Dan Castellaneta, but he hasn’t recorded any new lines specifically for the game – instead, Homer’s dialogue is comprised of archive clips from previous Simpsons episodes. In fairness, it does a good job of repurposing the old lines for new situations: when you upgrade his car he says “I get it, everything’s made of blocks”, a line originally from the Simpsons episode where the family visits Blockoland, a fake Lego theme park. As is the norm with every Level Pack character, Homer comes with two buildable gadgets. The first is Homer’s Car, the classic pink sedan he’s been driving ever since the show started back in the 80s. Homer’s second gadget is the Taunt-O-Vision, which initially appears to be a bit of a let-down but ends up being a little better than his car. In its standard form the Taunt-O-Vision is little more than the Simpsons’ television. It has a unique ‘taunt’ ability, which acts as a decoy and draws enemies towards it, but to the best of my knowledge this only comes into play as an essential tool in the Simpsons level pack itself and so isn’t a massive deal. 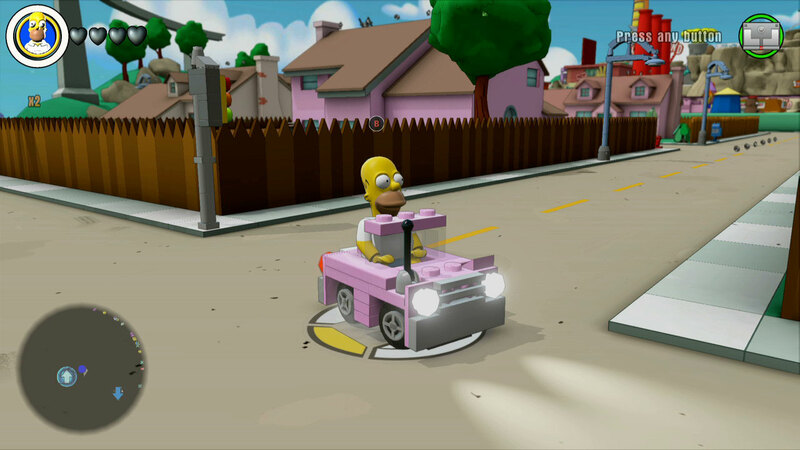 The Simpsons level pack is a solid add-on for Lego Dimensions. The level itself and Homer are the standouts, offering an entertaining, varied stage and an iconic character respectively. While the gadgets themselves don’t really add much that you can’t get elsewhere from other characters or gadgets, it’s still fun to actually drive the famous pink car and the weird mech version of the TV. At its original launch price of £30 it may be a little steep for some but it seems to have dropped in some shops, as you can see in the Amazon link below where (at the time of writing) it’s only £19.95. For that – considering it also unlocks the hefty Simpsons Adventure World in the game (which I’ll cover at a later date) – it’s worth a look for Simpsons fans. If you want to buy the Lego Dimensions The Simpsons Level Pack and fancy doing it through Amazon, please do it using this link: Amazon UK. It won’t cost you any extra and a cut of the profits will go to me, letting me invest back into improving the site.